For Christians to take the historical case for Jesus’ resurrection seriously is a surprising and, on the whole, positive thing. By even engaging in the discussion about whether or not we have sufficient evidence to think that Jesus came back from the dead suggests a number of important presumptions. First, and most obviously, engaging the topic indicates that you think the evidence matters. This is a vast improvement over the host of peculiar, and a-rational accounts of belief and its functions that have proliferated in the post-modern era. There are Wittgensteinian, Fideistic, Kierkegaardian, Tillich-ian, and Plantinga style approaches among many others, where, in one form or another, a straight up appeal to the facts is not considered necessary or even important to the grounding of religious belief. They aren’t interested in what actually happened or what our evidence is. As I see it, the insufficiency of the evidence for the resurrection utterly undermines the whole edifice of Christianity; as these non-evidentialist thinkers see it, the lack of evidence doesn’t matter in the slightest. So for the Christian to take the question seriously with those views in the background represents a huge step forward. It would seem that the historical believer and I agree about the basics at least: whether or not we have adequate historical evidence for thinking that Jesus was real and that he returned from the dead after being executed matters. Second, what a willingness to engage in the discussion about the historical evidence also suggests is that this believer is prepared, at least in principle, to change her mind if that is indicated by the evidence. She thinks that since the historical facts are X, Y, and Z, then presumably, she would admit that if those had been different—if Gospels were different, or if different archeological evidence had been found, or if the facts about how the story of the resurrection came to be known by us was different--then that would warrant her concluding that Jesus was not resurrected. So if the historically minded Christian believes that the facts about the Jewish oral tradition, or the history of the early church, or the things that Paul wrote in his letters all help to fortify the case for the resurrection, then we must assume that if some of those facts had been different, then she would acknowledge that the case for Jesus is not very good. You can’t have it both ways. You can’t argue that all historical evidence, no matter what it had turned out to be, supports your thesis no matter what or you’re not really giving a historical argument at all. And you can’t just employ those historical facts that suit you while ignoring the ones that are more uncomfortable. If the historical Christian is being intellectually honest with herself and with us, then she must be prepared to accept that the historical evidence could, in principle, disprove the existence or resurrection of Jesus too. That’s what gives her argument force (if it has any at all). She can say to the non-believer, “Look, you’re not being reasonable. Here is ample evidence that shows that the things that I believe are true. When we consider all of the relevant facts, they show that Jesus was real, and he was resurrected. Not believing in the face of this evidence is irrational. So failing to be a Christian is irrational.” (I freely admit that this is a rare and peculiar breed of Christian, but this view has some virtues that shouldn’t be ignored.) A really good question for the historical Christian, then, as I have been coming back to again and again here, is “what sort of historical evidence (or lack thereof) would lead you to conclude that Jesus was not resurrected?” If the answer is that there is nothing that could dissuade them, then there’s something seriously amiss. The same goes for the non-believer like myself who argues that there is insufficient historical evidence to prove the resurrection. What would convince me that it did happen? I’m pretty sure that there could be a sufficient historical case that I would find convincing. The problem is, however, that the evidence we actually have is orders of magnitude worse in quantity and quality than it needs to be to meet that burden. Another interesting aspect of the situation with the historical Christian is that she probably already acknowledges many cases in history where we have comparable evidence for the occurrence of some alleged supernatural event, but she does not think we should accept that evidence at face value. At the Salem Witch trials, during the Inquisition, at the founding of many world religions, and in many other ancient histories there are tales of magic, witchcraft, demon possession, visions of angels, the voices of gods, and miraculous events, but viewing them from our vantage we do not conclude that any of them were real. Richard Carrier points out that in Herodotus’ book on the Persian Wars, he reports without a hint of doubt “that the temple of Delphi magically defended itself with animated armaments, lightning bolts, and collapsing cliffs; the sacred olive tree of Athens though burned by the Persians, grew a new shoot an arm’s length in a single day; a miraculous flood-tide wiped out an entire Persian contingent after they desecrated an image of Poseidon; a horse gave birth to a rabbit; and a whole town witnessed a mass resurrection of cooked fish.” But the historical Christian will readily acknowledge that there was no witchcraft at Salem, black magic during the Inquisition, confrontations with the angel Moroni, or a mass resurrection of cooked fish. The skeptical principles that we apply to historical reports about fantastic, supernatural, and implausible events must be applied with uniformity to all historical cases, not just to those that we wish to reject because of prior religious convictions. See my posts on the Salem Witch Trials for much more. The other implication of the historical approach to Jesus is that one’s belief in Jesus now hangs entirely on the contingent and shifting state of the historical evidence. If some important find is dug up tomorrow that has significant implications for the Jesus story--an authentic, lost Gospel where Jesus says that he is going to fake his own death and resurrection, or something of that nature—then the believer would have to change her mind. I suspect, however, that the mind changing is not likely to happen with many believers, even ones who insist that their belief in based on the historical evidence for Jesus. For many believers, they will engage in the discussion about the historical Jesus and they will argue vigorously for the positive conclusion as long as it suits them. But no argument and no historical evidence could in practice actually dissuade them. If that is the case for a given believer, then this discussion is actually undertaken in bad faith, as it were. This is a believer for whom the evidence doesn’t really matter, she just says that it does. She’s deceiving us, and possibly herself by saying otherwise. Many of these believers will happily concur with any pro-Jesus argument from history that they hear, while treating any historically skeptical argument about Jesus with an artificially high level of criticism. Prior enthusiasm and commitment to a Christian ideology when brought to the historical question of Jesus creates a non-disconfirmable position. Pro-historical argumentation is accepted with little critical scrutiny, while anti-historical arguments meet with inordinately high levels of skepticism and criticism. All historical evidence is to the greater glory of God. As a result, the faux historical believer and the historical non-believer are actually playing two very different games, although one or both of them may not realize it. The faux historical believer is cheating—there is no outcome in which she doesn’t win. If she’s arguing for the historical evidence, but in practice she wouldn’t actually accept a good historical argument against Jesus, then, in effect, the only historical arguments that she will accept are the ones that support her conclusion. She believes, and she would believe no matter what the state of the historical facts. So the time and energy spent on the discussion could have been better spent by both parties. Let me be more specific about how the deck gets stacked in favor of one’s favored conclusion. We now have a mountain of empirical evidence that confirms what everyone who’s had one of these conversations already knows: humans have a very strong tendency to find evidence for the conclusion that they favor. That is, our beliefs and the evidence we find to justify them are distorted in the direction of our desires. This can be abundantly evident when the Christian comes to the historical Jesus debate with a strong prior conviction that Jesus was real and that he really was resurrected. If that prior enthusiasm is present, then it’s not hard to find, skew, or misrepresent the evidence in a way that pads it in your favor. Furthermore, the distortions often happen completely without your awareness. Here’s are two telling questions: how frequently does someone become a Christian as a result of his considering the historical evidence for Jesus’ resurrection? I’m not asking about how often are people led to Christianity by reading the Bible, but rather from consulting the historical arguments that would establish that anything stated in the Bible is true? By contrast, how often does someone adopt the Christian views held by his parents from his childhood, and then conclude that there is a compelling historical case for the existence and resurrection of Jesus? Here’s a tiny portion of empirical evidence about the effects of desire on belief formation and evidence gathering, taken from Jonathan Baron’s Thinking and Deciding. McGuire, W. J. (1960). A syllogistic analysis of cognitive relationships. In M.J. Rosenberg, C. I. Hovland, W.J. McGuire, R. P. Abelson, and J.W. Brehm (eds), Attitude organization and change(pp. 65-111). New Haven, CT: Yale University Press. Weinstein, N. (1980). Unrealistic optimism about future life events. Journal of Personality and Social Psychology, 39 806-820. Babad, E. and Katz, Y (1991). Wishful Thinking—against all odds. Journal of Applied Social Psychology, 21, 1921-1938. Weeks, J.C. Cook, E.F., O’Day, S.J., Peterson, L.M., Wenger, N., Reding, D., Harrell, F.E., Kussin, P., Dawson, N.V., Connors, A.F., Jr., Lynn, J., and Phillips, R.S. (1998). Relationship between cancer patients’ predictions of prognosis and their treatment preferences. Journal of the American Medical Association, 279, 1709-1714. Lowin, A. (1967) Approach and avoidance: Alternative modes of selective exposure to information. Journal of Personality and Social Psychology, 6, 1-9. Frey, D. (1986). Recent research on selective exposure to information. In L. Berkowitz (ed. ), Advances in experimental social psychology (Vol. 19, pp 41-80). New York: Academic Press. Brenner, L.A., Koehler, D.J., and Tversky, A. (1996). On the evaluationof one-sided evidence. Journal of Behavioral Decision Making, 9, 59-70. So the real question that is more fundamental than the historical evidence for Jesus is, did you come to the historical debate to confirm what you already believed, namely that Jesus was resurrected miraculously, or do you come to the historical debate prepared to accept the results of applying fair, uniform, and appropriately skeptical standards of reasonableness whatever results they may indicate? I’m really only interested in discussing it with the latter. "There are Wittgensteinian, Fideistic, Kierkegaardian, Tillich-ian, and Plantinga style approaches among many others"
I think the easiest thing for the believer to fall back on is the idea that a god could create or destroy evidence as he sees fit to maintain the "faith" aspect of the religion. I know it's ridiculously circular, but in their place that would be my first reaction. But then I'd have to ask, is faith a fundamental aspect of religion, or a by-product of the lack of evidence/reason? They seem like similar ideas, but if it is the former, it will be neigh on impossible to convince someone to even look at evidence. They will say not only is there no evidence, but there isn't supposed to be any. Any evidenciary argument, they think, will be null and void. If it is the latter, the more reason-based religious person should (I hope) readily except the idea and possibly be able to fundamentally change their mind on how they view religious ideas. Now I'll go look up those big words. Thanks Matthew. Those terms seem pretentious, I know. All I mean is that there are a bunch of strange existential, post-modern, and post-natural theology views out there. See Wittgenstein, Kierkegaard, Tillich, and recent Plantinga. If someone takes this "God destroys or creates evidence as he wants" line, then we're just done. They need to be dumped back into the hopper and recycled. Have you seen Richard Carrier's latest article on his website? Pretty good stuff if you ask me. Thanks AIG, I'll read that. Looks interesting. A thought: one mistake that many people in this discussion have been making is to treat the question as a historical matter. The history of the Jesus story is important of course, but even more important are all the things we now know about the way human judgment works, psychology, confabulation, hallucination, and so on. The epistemology and the psychology are more important in the case of the history of over wrought religious zealots. Good post. One person you left out is William Craig who says he knows Christianity is true because of the "inner witness of the Spirit." Although he makes a pretense of being interested in the historical evidence, he is on record as saying that even if the evidence was against the resurrection, he would still believe it was true because of the inner witness. Why no one calls him on this in a debate is a mystery to me. 1. Its firmness--how infirm a foundation history provides. It seems religion requires something less shaky than the kind of evidence provided by most of ancient history. Maybe pieces of ancient history could provide a secure foundation--imagine a (weird) religion founded on the proposition that Julius Caesar was assassinated (maybe also specifically be Brutus, Cassius, etc.) on the Ides of March. As historical facts go, this seems a pretty secure one. Surely it rates as high as Sanders’ highest rated certainties about Jesus. But if one moves from Rome and imperial affairs to the provincial back water that is first-century Palestine, and to the the gospel/Pauline record (with a little Josephus and Tacitus and such thrown in), it would seem one is driven to rely on a kind of empirical evidence that entails some considerable uncertainty. And considerable uncertainty must undermine--remove the foundational character of--a set of beliefs one takes to be indispensable for salvation and to point toward guideposts that determine the direction of one’s life. In other words, Wittgenstein was onto something when he noted that religious believers in fact do not believe in a way that at all resembles the way professional historians believe. This isn’t just accurate sociology, it’s also good philosophy/theology. Religious conviction is of a type that empirical investigation cannot subserve. 2. There’s a good thing about Plantinga and Tillich. When you do history well, and conclude that by the application of ordinary historical standards, the case for the historicity of the Resurrection is weak, they may hear you and not come up with bogus counter-arguments. (Though I’m not sure but that Plantinga might not--but at least he’d see the strength of your evidentiary case.) That is, Craig and Habermas and even Wright, though he knows better, feel compelled, because they are evidentialists, to do bad history--to become special pleaders for orthodox Christianity, to traduce normal standards of historical inquiry. But since their faith doesn’t rest on normal historical inquiry, but elsewhere (granted, maybe only in some other epistemic swampland), they aren’t forced to misapply, distort, ignore, standards of historical inquiry. So from the standpoint of a religion one can believe in--seriously believe, build one’s life around, stand on and move out from--the flimsy evidence of the evangelists and Paul (and maybe much of the rest of the evidence historians have to make do with) serves the believer only ill.
And the non-evidentialist need not be but a faux historian, can be a true believer. I believe some (Avalos for one) have called Craig on this. But anyway, even though he does say the awful thing, does he really mean it? To me, he seems quite sincerely (however mistakenly) to believe that he does have a solid case built on the application of normal historical standards. We know his apologetic well--it's in his Reasonable Christianity book, many of his occasional pieces, every debate. And that apologetic case does NOT rest on the notion "you should believe because when I was seventeen (or whatever) the Holy Spirit transformed my life." It rests on what purports to be solid, informed, logical reasons of a kind that could weigh on the objective reader or listener. So yes, rhetorically, he's on record saying (maybe for theological as well as autobiographical reasons) "what's decisive isn't what I'm about to say." But then he goes on to say a great deal that, were it valid, should sway us--and sways him. There is an excellent article entitled, The Jesus Nobody Knew, which you might find relevant to this discussion. You lump the historical existence of a person named Jesus and the question of the historicity of his resurrection together in this argument, but the consequences of these two claims are not entirely equivalent. 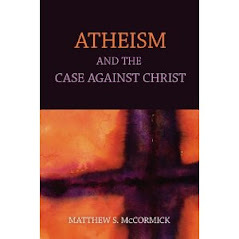 The question of the existence of a person named Jesus will hurt the theist case if answered in the negative, but will not hurt the atheist if answered in the affirmative, since the this is a quite ordinary answer to a quite ordinary question, and does not go far at all in supporting the miraculous and supernatural claims attached to that person, for reason which are addressed in your argument. Or, as I like to put it: was there a real lumberjack named Paul Bunyan? Does it matter? Of course this all goes the other way too. An atheist engaging in this debate has to be at least open to the evidence, when in fact many do not appear to be. Richard Carrier who you cite is a good example of this. He was defeated by William Lane Craig in their debate, even by his own admission. And yet what happened? Did he alter his views? Superior debating skills are not the same thing as superior arguments. I briefly flirted with fideism not too long before my deconversion. Wittgenstein and historical arguments played a significant role in that process. It was Wittgenstein (and majoring in math) that made me realize that belief/axiomatic systems can be in opposition yet internally consistent. And that was how I realized that to be rational in my belief I needed to see how it looked from the outside(this was long before Loftus coined his "outsider test for faith). And so I did, and the historical and textual analysis (and majoring in religious studies)did my childhood belief system in. So it isn't true that Christians proposing the historial approach aren't completely intellectually honest. It's just that the ones that are completely honest about it usually end up agnostic and then atheists.